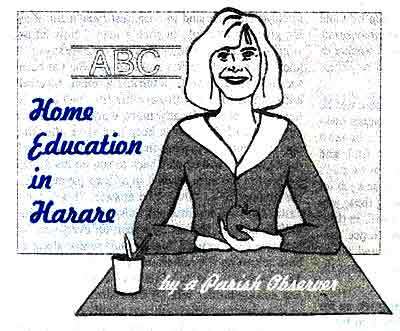 Is it possible that the embryo of a Traditional Catholic School in Harare has indeed been started? It all goes back a couple of years when some parents in the Parish, wanting a School and following the development of the enviable one under Fr. Wall in Roodepoort, decided to make a move. With Fr. Ockerse’s permission, they formed a School Committee and some good fund-raising was done towards a school (which funds are now earning good interest for the day we have a future school). At the time, a very suitable Anglican School property, with even a small chapel, became available: however, SSPX is not in favour of leasing and the School Fund could not afford to buy the property. Several other proposals were then investigated. Although it had also been suggested that the Retreat House be used for classes during the School Term (with the School Holidays set aside for Retreats), Father did not feel this would work. Eventually, it was suggested that interested mothers home-school in their homes for the time being. In fact, One interested mother had already been home-schooling her only son for a while. In the meantime, another mother had reached the point where she felt the Faith and also the education of her three children was being marginalised in the private Primary School they were attending. So she took the bull by the horns and bravely decided to home-school her three children. Providentially, she was able to team up with the experienced mother who then took over the helm as “Headmistress”. God was not wanting in rewarding this courage with a venue through the incredible generosity of another Parish couple who agreed to the use of part of their spacious home for the school, with access to their private chapel. So, in January this rear, four young children arrived in their attractive school uniforms (designed by the two mothers) far their first day at “Our Lady of Fatima Home School”. In the second term, a third mother bravely joined the Home School with one of her two sons – the other will be joining next year. Any other mother in the Parish interested in the Home School will equally have to make the big sacrifice of their mornings to home-school their own children at this centre, and also bear all the related costs. The parents are using the American ACE (Accelerated Christian Education) Home Schooling programme which is, in fact, being used by various Home Schools springing up in the country. The programme is easily accessible here and operated countrywide by a very efficient couple in Rusape. Whilst ACE is not cheap, it is certainly less expensive than the escalating fees of private schools. Although ACE is not Catholic as such, it is profoundly Christian, and the mothers have been able to “Catholicize” it, where necessary. How have the children fared so far? Although one or two were initially apprehensive about the new venture, they now love their new school. Their progress has been very rewarding. Each child works at his/her own individual pace. and they are all on different levels. Provided they keep up with their scheduled goals known as “Paces”, they do not have to take home any homework. Not only have they done very well academically, but the programme is enabling them to catch up on the educational deficiencies of their previous schools, by doing what are known as “Gap Paces”. The discipline is enforced by a systems of stars and demerits respectively for effort or for misbehaviour. A Library has now been established in the school which already has a substantial number of suitable books. It is also hoped eventually to include Music Appreciation classes to complement swimming and other sports. Staff, parents arid pupils of Our Lady of Fatima Home School. The ACE Programme also includes “Field Days” which are earned for good effort. In this regard, the children eagerly looked forward to some “Field Days’ organised at the end of the first term, which included a most interesting visit to a bus manufacturing factory. During the second term, it is hoped to take them to see the Tobacco Auctions during the peak of the selling season. (Zimbabwe has the largest Tobacco Auction Floor in the world). Most importantly of all, the Catholic school environment new to the children is starting to deepen their Faith and encourage them in the practice of virtue which is so rewarding for the parents. It is wonderful to see crucifixes, Catholic pictures and holy water everywhere. The uprights of the “enclosed” desks are decorated with holy cards, prayers and edifying pictures of the pupil’s own choice. The school day starts with a brief Assembly, followed by prayers and a hymn in the chapel (albeit that the Blessed Sacrament is obviously not present), and ends with another visit to the chapel. The parents are very grateful to Fr. Ockerse for kindly allowing Fr. 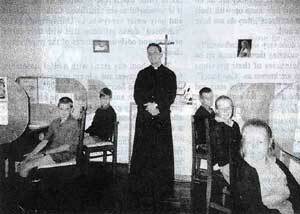 Aiessio to give Catechism lessons twice a week. How have the parents coped? The mother of three and the latest mother to join are gratefully learning so much from the “Headmistress” who must be highly commended not only for sharing her skills which necessitated a big sacrifice in moving her son’s home-education to the school at the other side of town, but also for her hard work and efficient supervision. The mothers will be the first to admit that it has not been easy for them to re-organise their whole lives and take on such an all-encompassing venture, as they also have a great deal of administrative work to do in the ACE Programme, over and above the teaching guidance. It is not difficult to see the Hand of God in this new venture. May He continue to guide and help the wonderful mothers in their sacrifice to provide their children with the next best thing to a Parish Catholic School. May He one day provide clergy and Sisters to continue with this good work when the size of the Home School warrants it. And may He bless the couple who have been so generous and helpful in giving the use of their home for “Our Lady of Fatima Home School”.